By Bandler, Richard; Grinder, John. Palo Alto, CA: Science & Behavior Books, 1976. First Printing of Paperback Edition Glossy Pictorial Wraps Near Fine in Wraps 8vo (8vo (6 x 9), 198 pp including Bibliography. Book is Unread, Unmarked, and FINE with only a slight crease and a point bump on the upper right front cover. Otherwise, AS NEW. 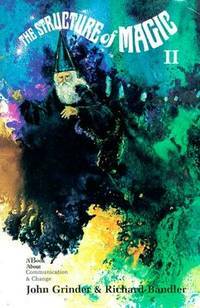 (h) Their second volume on the structure of magic (magic as what psychotherapists can do by reassembling reality constructs) with examples and techniques. Children of the Future: On the Prevention of Sexual Pathology. New York: Farrar Straus & Giroux (T), 1983. First Edition, First Printing Cloth AS NEW in AS NEW DJ 8vo (5-3/4 x 8-1/4), 221 pp. Hardbound book is FINE -- unread, unmraked and AS NEW in AS NEW glossy pictorial dj. (h) Wilhelm Reich escaped Nazi Germnay only to be hounded and imprisoned for his writings in America -- becoming the only writer in US history to have his books burned by the US government. His focus on criminal behavior as a form of sexual pathology got him in trouble. His pointing to preventing children from genital gratification (masturbation) as a major component of sexual pathology was not well received by post WWII America which totally misinterpreted what he was aying. Now, fifty-plus years later, we can read his writings and realize his censors seem to have been responding to their own sexual panic rather than the ideas Dr Reich proposed. A brilliant work. 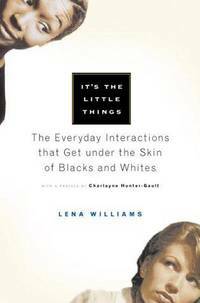 It's the Little Things: The Everyday Interactions That Get under the Skin of Blacks and Whites. By Williams, Lena; Foreword by Charlayne Hunter-Gault. THE MAKING OF BLIND MEN: A Study of Adult Socialization. New York: Russell Sage Foundation, 1969. First Edition, First Printing Cloth Fine in Very Good DJ 8vo (6 x 9-1/4), 145 pp including Index, Bibliography, and 2 Appendices (Appendix A: History of Work for the Blind, Appendix B: The Relationship Between Scientific Theory and Practice Theory. FIRST EDITION of this Hardbound book, book is unmarked and impeccable -- FINE/AS NEW in black cloth cover, white type on spine. Pictorial DJ is VERY GOOD -- some edgewear and corner bumpings, small (1/16") chip top of spine, slight smudge/soiling on white back of dj -- protected in Bro-Dart clear cover to prevent further wear. Brilliant study of behavioral adaptation of adult blind to conform to the images, expectations, and presumed social roles held by their rehabilitation and caregivers.